This article was originally published on The Fix. No one doubts that the legacy of alcoholism is toxic. But do we really know as much about the effects alcoholics have on innocent bystanders as we think we do? Like an ill wind sweeping across time, alcoholism inflicts multi-generational damage. It is the gift that keeps on giving—in the same way you see a flaming sack of manure left on your doorstep as a gift. No one doubts that the legacy of alcoholism is toxic. But do we really know as much about its effects on innocent bystanders as we think we do? As a living, breathing adult child of not one but two alcoholics, I’m not sure we do. Out of the vast sea of individual timelines disrupted by alcoholism, commonalities will inevitably emerge. But pinning them down and identifying them—all of them—may be a trickier proposition than we assume. From my personal experiences and observations, I do think there are some misconceptions about what it means to be the adult child of an alcoholic—at least for some of us. Not so much false beliefs, but common assumptions that are only partially correct. Or premature conclusions based on inadequately analyzed data. One caveat: what I list here as misconceptions are largely based on what I’ve seen, felt, known and experienced in my own life, so naturally my perspective is grounded in something less than universality. But then again, so is everyone else’s, whether they are conscious of it or not. Is the true culprit the alcoholism, or the alcoholic? Is problem drinking the destroyer, or is it the drinker’s personal demons, planted in the subconscious by past experience and endlessly playing the role of family saboteur? Alcoholism is, at best, a co-creator of the chaos and soul repression, and if you could magically banish it without addressing the underlying issues, something just as disturbing would likely rush in to fill the vacuum. Alcoholism is an accomplice to the crime, maybe even the primary plotter. But it is not the lone assailant. No, having alcoholic parents who don’t get help for their struggles hurts kids and sets them up for a lifetime of difficulty. We don’t have an alcohol crisis as much as we have a treatment crisis—as in treatment either isn’t available, isn’t pursued (my dad didn’t feel it was necessary because he was very successful in his field) or isn’t effective (my mom considered it but had seen others relapse and she concluded that it wouldn’t work) in the vast majority of cases. Alcoholism is a disease that can be overcome, and often is overcome. And when that happens, family life can be rejuvenated, especially if the recovering alcoholic is able to face and address the root issues at the heart of the substance abuse. But when the drinking is allowed to go on and on, merciless and pitiless in its depredations, that is when the lasting damage occurs. The risk of alcoholism for adult children of alcoholics is about four times that of the general public. Overall, about 25 percent of those who grow up in homes with at least one alcoholic parent will struggle with alcoholism later on. Those statistics are noteworthy, but hardly as overwhelming as you might expect. Up to three-quarters of those who are immersed in an alcoholic environment during childhood and adolescent years will not encounter similar difficulties in adulthood. In reality, growing up around alcoholism is a consciousness-raising experience for most of us, and it helps inoculate us against the possibility of repeating an awful pattern. If you survey any random population of alcoholics, you’ll find that one-third of them had a mom or dad, or both, who also struggled with the disorder. But the other two-thirds of alcoholics are charting their own unique path of dysfunction and self-destruction. Among the latter group, there may be other statistically significant commonalities that help explain the retreat into alcoholism—such as exposure to childhood abuse, bouts with PTSD, a history of depression and/or anxiety, and so on. But we would undoubtedly find similar co-occurring factors among the one-third who grew up in alcoholic households, which suggests that cause-and-effect with alcoholism is complex, individualized, and not easily reducible to simplistic formulas. 5. Adult Children of Alcoholics Are Filled with Unresolved Rage and Resentment Toward Their Parents. Overcoming These Destructive Emotions Is One of the Greatest Challenges They All Face. This may very well be true for adult children of alcoholics who underwent severe physical, sexual or emotional abuse at the hands of their parents. Thankfully, this is not what I experienced, and for me, forgiveness and compassion for my parents’ struggles has been fairly easy to come by. Even when they were still alive, my thoughts and feelings about them were charitable and empathic most of the time. If I have any unresolved rage, it is toward alcohol itself, which put my family through the ringer and refused to release its hideous grip on decent people who worked hard, did their best, and deserved a better fate. For the most part, adult children of alcoholics are kind, loving and forgiving people—in part because they have to be to survive. With all due respect to the researchers responsible for such studies, numbers like this are largely imaginary, in part because the life histories of adult children of alcoholics are not taken into account. All things considered, those of us included in this category do a pretty impressive and outstanding job of avoiding the traps that ensnared our parents—hence my choices for misconceptions 3, 4 and 5. 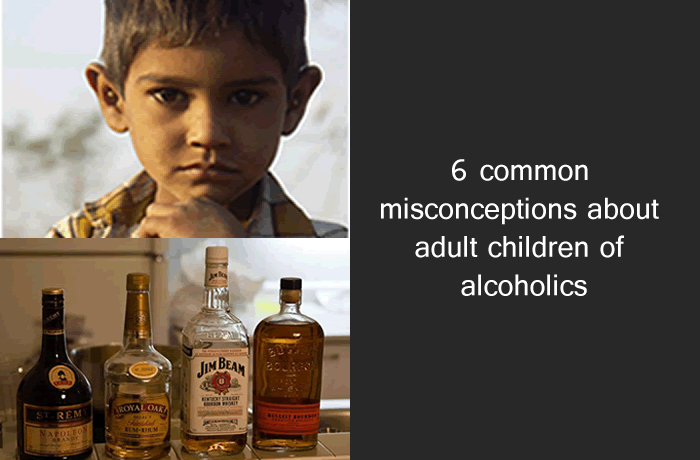 But growing up around alcohol abuse undoubtedly leaves its mark, and in this area, researchers have provided loads of high-quality data that show how childhood exposure to alcoholism can impact us as adults. Self-esteem problems, an inability to trust, stress management difficulties, abandonment issues, harsh self-judgments, depression and anxiety, turmoil in relationships, vulnerability to other forms of compulsive behavior or addiction—the list could go on and on. And all of us who grew up in alcohol-soaked households will recognize themselves somewhere on this menu of misery. The emotional suffering involved in all of this is undeniable. But what about the costs in lost potential and underachievement? How much more could some of us have accomplished in life (or earlier in life, assuming we manage to get our acts together at some point) if we hadn’t been weighed down by our pasts, hounded by hungry ghosts that refused to be sated? No matter how hard we work to overcome our personal issues, they always exact a price, and one that is not easy to quantify. If we had an accurate way to calculate what our society and our economy has lost as a result of the ravages of alcoholism (plus co-occurring disorders), including its lifetime effects on the adult children of alcoholics, the number we come up with would blow that $166 billion annually figure right out of the water. Adult children of alcoholics are, for the most part, survivors. But we don’t emerge from the battle unscathed, and the scars we carry are the scars of society as well.